I do not know about you, but I am a bar junkie so this Blueberry Oat Bar recipe screams my name. I love bars because I can grab them quickly when running out the door and sometimes they replace sweets for my lunches or afternoon cravings. Many pre-made bars like energy or protein bars can be loaded with extra calories and way too much added sugar. Making your own bars can be even more delicious and healthier options without all those unnecessary ingredients. Sugars are carbohydrates and they are the preferred energy source for our cells. Insulin is a hormone that acts as a key to opening the door for carbohydrates to enter our cells. Research has shown that when we have too much added sugar in our diets, insulin becomes less effective, which means that the carbohydrates or sugars are staying in the bloodstream. This is a condition known as diabetes. When we make our own foods like energy bars as we have here, we can reduce the amount of added sugar we consume, which then reduces our risk of diabetes or other health complications. To make these bars, start by mixing the applesauce, honey, cinnamon, and vanilla in a bowl. Toss the oats, nuts, and dried fruit into a food processor and blend until it is an even consistency. Add in your applesauce mixture and pulse together until everything is evenly blended. Line an 8x8x2 inch pan with parchment paper. Add the oat mixture to the pan and bake at 350F for about 20-30 minutes or until the edges begin to brown. Remove from the pan and slice into bars once they have cooled. I love having homemade bars on hand for those days on the go or making them for those road trips when you know you’ll be looking for a yummy snack. 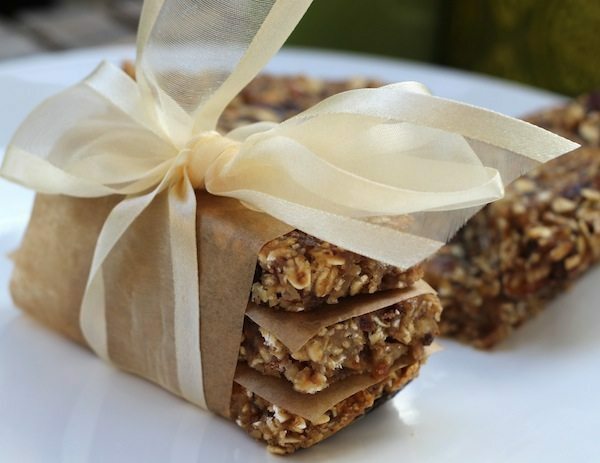 Have you made your own energy bars before? Let us know what you think in the comments below! This is such an easy recipe! Didn’t know granola bars (healthy) were so easy to make. Will definitely give these a try. Thank you sharing! 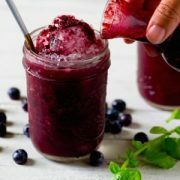 Can fresh or frozen berries be used? Most dried are sugared which I can’t do. I use fake honey or school syrup as a sub for honey. 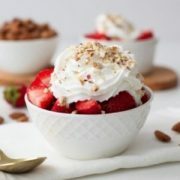 What is a good substitute for the almonds? there are no dates in the recipe? just checking because they’re in the photo of ingredients, right? thanks! Could I try it with frozen blueberries? 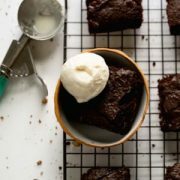 I just made these and they are so very yummy! And I feel like I could use it as a base for other yummy bars (different fruits, nuts, etc). Highly recommend!! Is there any way to make these into crispy granola bars? I mean, I love them chewy but I also like crunchy bars too! Just curious. is there any substitute for the applesauce? yes you can use bananas- 1/2c applesauce can be swapped for 1 banana- results may vary though depending on what kind of recipe you’re doing. sorry! we don’t do nutrient calculations because it’s so time consuming to do it accurately. Just wanted to mention that you should really use parchment paper instead of wax paper for baking. Wax paper can melt wax into your food and can even ignite in the oven! OK to wrap the cooled bars in wax paper later, though. Will it come out okay if i blend the dates into a paste and use instead of honey? Hello! Can I leave them in the cabinet wrapped in parchment paper or sealed in plastic wrap? If so, what is the shelf life. I know I can freeze the left over bars, but am just curious because I probably won’t finish a batch right away.